Check the flyer for the schedule. Sessions for each elementary school are set for Tuesdays from 3:30 to 4:30 PM at Franklin High School. About Empty Bowls: Empty Bowls is charity project, which works towards fighting hunger in local communities. The Empty Bowls Club at Franklin High School will spend the year making 400 ceramic bowls teaching students how art can make a difference. 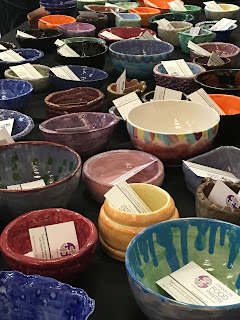 At the conclusion of this project, The Empty Bowls Club and the Franklin Food Pantry will co-host a fund-raiser at the high school on Tuesday, May 1, 2018 from 6:30 to 8:30 PM. About Kids Corner: Kids’ Corner, a program of Franklin Public Schools Lifelong Learning Institute and Lifelong Community Learning, is a unique collection of after school activities for children with the goal of making learning fun. Classes are small, relaxed and designed to encourage children’s creativity …… a place where fun and learning meet. "School choice money can be a major factor"
"a great thing considering the town’s history"
"It's all about the money"